How will history judge ‘Australia’s Guantanamo’ for refugees? If you were to ask Australians to name some of their highest aspirations as a society, a phrase you would hear repeatedly is “a fair go.” Australians pride themselves on being a nation in which everyone gets a fair shot at prosperity. The classism of the United Kingdom is largely derided here; an attempt to bring back the honorifics of Lord and Lady by a recent prime minister was received so poorly it shook support for him within his own party. Eventually, they ousted him. Australians pride themselves on being a nation in which everyone gets a fair shot at prosperity. But when it comes to asylum seekers, Australia has struggled in recent decades to offer a humane and timely resolution to their claims, let alone a fair go. In the wake of increased boat arrivals and deaths at sea, the federal government declared in 2013 that no one coming by boat to Australia would ever be permitted on the continent, even if their claims to asylum were proved genuine. Previously abandoned camps in nearby Papua New Guinea and Nauru were reopened, and over the last five years thousands of asylum seekers have been sent there. And there they have been trapped as Australia has refused to send even those acknowledged to be genuine refugees to any country that might make the hardship of traveling by boat seem worthwhile. So for instance when nearby New Zealand offered to take 150 refugees from the camps, Australia refused, claiming that to do so would be to signal to other asylum seekers and people smugglers that the trip was worth the risk. “We’re protecting them,” three successive Australian prime ministers—from both of the major parties and all of them Catholic—have argued. When it comes to asylum seekers, Australia has struggled to offer a humane resolution to their claims, let alone a fair go. In the meantime, visitors to those camps—including government-contracted doctors, teachers and other staff, human rights watchdogs and the United Nations—have all repeatedly condemned the camps for their squalid conditions; the suicide attempts and rampant uptick in mental illness; the hostility, the sexual assaults and other violence perpetrated by locals (and some guards). Most asylum seekers that have been given refugee status in Papua New Guinea have ended up returning to the camps for safety. 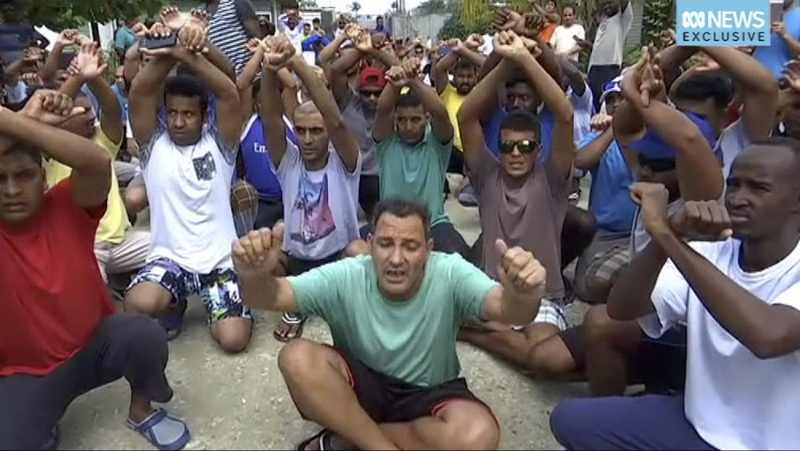 In June Australia was forced to pay $70 million to 1,900 asylum seekers who had sued over their treatment in the Manus Island camp of Papua New Guinea. And a year ago, Papua New Guinea’s Supreme Court ruled that its camp on Manus Island was unconstitutional, a violation of residents’ human rights. Last week that camp closed, and the Australian government withdrew, leaving nearly 600 asylum seekers, many of whom have been determined to be genuine refugees, with no place to go. There have been reports of local men with machetes looting the camps for things like fans and air conditioners; there is no working sanitation or power. People are capturing rainwater for drinking. Yet they refuse to leave out of fear for their lives in the local community. A deal to send upwards of 1,000 asylum seekers to the United States more or less fell through when Donald Trump was elected. A deal to send upwards of 1,000 asylum seekers to the United States more or less fell through when Donald Trump was elected; so far just 54 have been resettled. Last weekend New Zealand offered once again to take some. Again it was refused. But though there is little question that what the Australian government is doing is not only illegal but inhumane and unnecessary, the pressure to do anything about what many have called “Australia’s Guantanamo” so far remains limited. Protests have been ongoing, press coverage has increased. But the federal opposition party—led by another Catholic—supports the fundamentals of government policy on asylum seekers (though it did recently suggest the government take the New Zealand deal). And Prime Minister Malcolm Turnbull argues that those on Manus are being coached by activists. Is the systemic dehumanization of thousands of innocent people a bad thing if it doesn’t lose you any votes? Ms. Gottardo thinks so. “Australia will be judged very strongly by history,” she says. But both the Australian government and its opposition continue to bank on the answer being no.